Wind, wind and more wind. Seems to be autumn around here. A quick lunch-hour (ok, 90 minutes) rip out to Iona Beach Park. It was a stunning day, and with buckets of rain forecasted starting Friday, I decided to take advantage and stretch the legs after the Victoria ride. 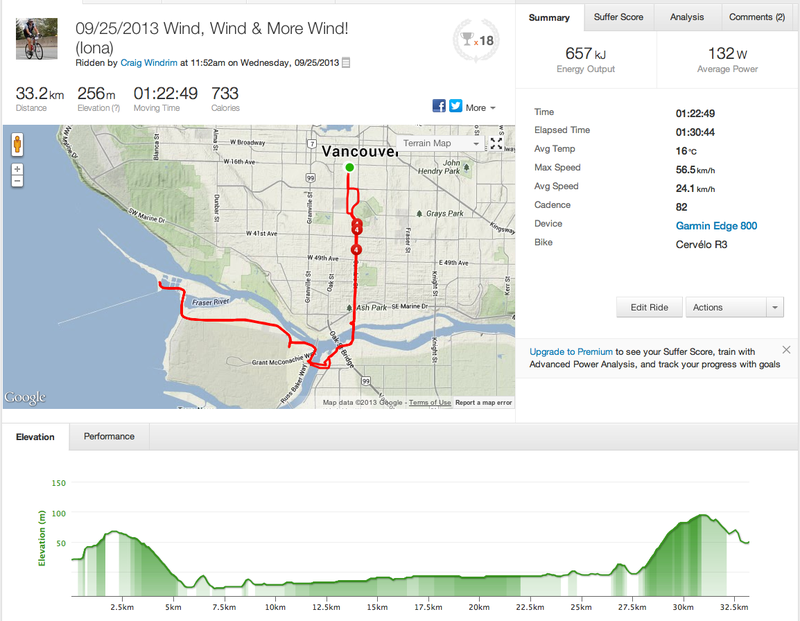 I thought I’d had enough wind on Tour de Victoria, well apparently not. The white-caps were out in force on the Straight, and small aircraft landing and taking off at YVR barely looked like they were moving. Winds were measured at YVR out of the Northwest at 36 km/hr according to Environment Canada. I’ll take wind on its own though, sans rain, since it’s such good training and a stimulating challenge. Funny enough, on the outgoing westward stretch of Iona I was averaging 22 km/hr, whereas 45-50 km/hr on the way back with the wind behind. Quite a difference!